The company specialises in preparing specifications and managing subsequent work. CHRISTOPHER WHITE ASSOCIATES are not only Chartered Surveyors but also have many years of experience in management of building works. We are able to act for private individuals requiring extensions, renovations or alterations to property, also to managing agents, resident associations and Councils. 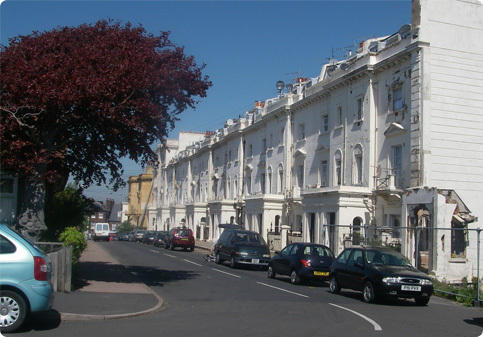 One of our current projects is at Orwell Terrace in Dovercourt, Essex where we have been appointed as Project Managers to specify and oversee restoration works to a Grade II listed row of Mid Victorian terraced houses. The terrace has huge historical value to the town of Dovercourt and the works to restore as near as possible to original features will have a big impact on the townscape and will enhance the historic character of the building. CWA will also prepare specifications for works following diagnosis of faults within a property, we can obtain tenders for work and manage the contract to successful conclusion. can also advise as to the state of a particular property and on larger buildings we can prepare a maintenance programme to assist with future repairs. We are willing to discuss new projects and give you the benefit of our experience. We particularly specialise in renovation / alteration of older property, and can provide the expertise through the experience of handling many such projects over the years. CWA will act for insurance companies or for private individuals and negotiate a claim. We also provide rebuilding estimates for insurance purposes. Fire, Flood, Storm.Unfortunately these incidents occur, and this is the time our surveyors will be able to help. We will inspect the property, provide advice on cause of damage and extent of repairs required and make recommendations with regards to a building insurance claim. We prepare specification of works and liaise / negotiate with the loss adjusters / buildings insurers on the client’s behalf regarding extent of repairs to be carried out under the claim. We act as Contract Administrators, overseeing the project through to completion. We particularly specialise in damp, rot and insect infestation, and can provide the expertise through the experience of handling many such cases over the years.